Hello, my name is Sheryl Lazarus. One quarter of my genes come from the woman who wrote this diary. I’m seeking to learn from the past and gain insights that will lead to a better future. I’m posting the entries because friends and relatives might also be interested in the diary. As I read the diary I find that many of the entries spark questions and that I search for answers. If I find answers—or even if I’m am just reflecting on an entry—I’ll share them with you. In 2009, I compiled a family cookbook. Some of the recipes had originally been recipes of my mother and grandmothers. I included some family photos in the book. One of them was a photo of me walking through a doorway at my bridal shower. 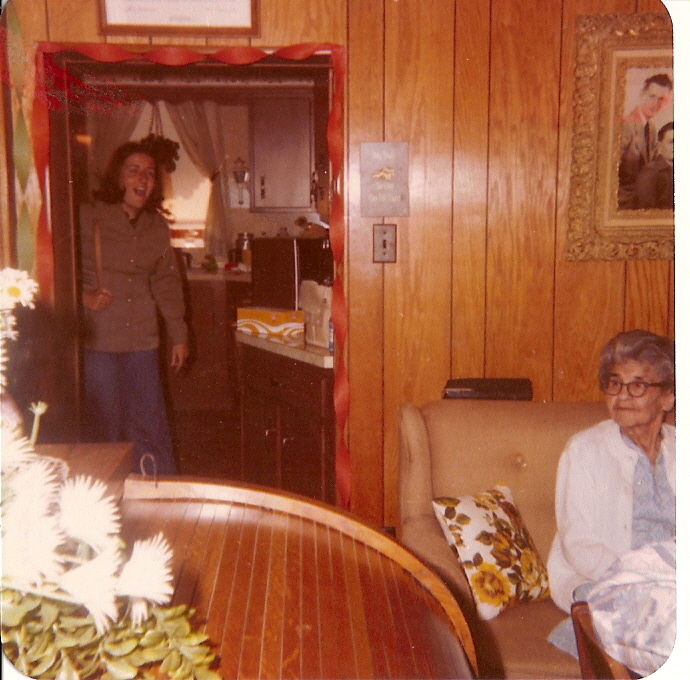 Sitting on the couch in the photo’s foreground was my 82-year-old paternal grandmother. After Grandma Swartz died in 1980, her children went through her belongings. One of the items they found was a diary that Grandma had kept from January 1911 through December 1914. Her children circulated that diary amongst family members. While I had it, I made a copy before passing it on. The copy laid in a paper bag in the bottom of my hutch for more than 20 years until I pulled it out in January 2010 and started reading. My memories of Grandma Helen were of a feeble, elderly woman—Helena (the name she used in the diary) was a fun-loving, self-absorbed teen. Helena wasn’t an Anne Frank—and most days she only wrote three or four lines. Some days she wrote that “nothing of importance” had occurred. Yet as I tried to decipher the handwriting a fascinating young woman emerged, and I wanted to learn more about her and how she evolved into the grandmother I remember. Preparing Grandma’s diary entries has provided me with a wonderful opportunity to reconnect with relatives, neighbors, and friends. I would like to thank the many people who have shared information with me about my grandmother. I’d especially like to thank my father for all of the wonderful stories, and my aunt and uncle for the photos of Grandma as a young woman. What a lovely treasure. Thanks for sharing. Thanks for the nice note. I have really enjoyed pulling this together, and learning more about my grandmother and her times. It’s always nice to hear when someone enjoys this blog. There’s a new post every day so you can just check back daily. I think that you can also click on the entries rss feed in the header to get all of the updates–but I must admit that I don’t completely understand how all of that works. Hi there. I just want to tell you how much I enjoy reading about your Grandmothers diary and the comments you include at the end. It is so very interesting. Thanks for sharing. You have a treasure in her diary that is for sure. Thanks for the nice comment. I enjoy sharing the diary and it is always nice to hear when someone enjoys it. I really enjoy your blog. I found it while looking up some of my ancestors names. I do believe I am related to the Gauger’s your Grandmother mentions. Do you have the first names of any of them? Grandma’s sister Ruth married William (Bill) Gauger. They lived on a farm just north of McEwensville, and had two children William Jr. and Shirley. (They also had a child who died in infancy.) The tombstones for Ruth, William, William Jr. and the infant are in the McEwensville Presbyterian Cemetery. William’s older brother, George Anthony, was my great grandfather. George’s daughter, Miriam, is my grandmother and is 93 and still alive. I will have to ask her about her Aunt and Uncle as well as your Grandmother. I am sure she knew them. Everyone knew each other back then. It’s cool that your great grandfather is related to some of my relatives. I’d love to hear your grandmother’s stories. I don’t know much about that branch. Sheryl, thanks for the comment on my “Be-Attitudes for Geneablogging…” post (http://tinyurl.com/3eh3kq2). I have incorporated your comment as a new item (“Be Happy). Thanks for reading and commenting. What an incredible journey. What a blessing you have to be able to “walk” with your grandmother as a young girl. It’s something so many of us would like to do but, alas, don’t have the written record to help. I look forward to getting to know your grandmother (and you!) better. I just found your blog and I’m enjoying it so much! It is wonderful to have photographs but even more revealing to have the written word. Thanks for stopping by. It’s always wonderful to hear when someone enjoys the diary and photos. What a fantastic idea and wonderful project! I just stumbled upon this today, I look forward to reading earlier entries. Your grandmother and you both have a wonderful way with words! I’ve been following your blog since I discovered it, but that’s only been a few months. I didn’t realize that you began at the beginning of 2011. I think you should try to publish your blog and your grandmother’s diaries as a book. (Did I already suggest that?) I would love to be able to sit down with it and read through it at leisure. I love the photo of your grandmother on the couch. With that photo and the one at the top of the blog side-by-side, it’s easy to see how she aged. Some older people don’t look like their younger selves, but your grandmother definitely does! Thanks for sharing. It’s such fun to read her entries and your thoughts. It is fun to look at the photos of my Grandmother and see how she aged. When I first thought about doing something with the diary I thought of doing a book, but it seemed like too daunting a task. I’ve found it easier to research and post short entries in the blog. It almost seems like each day’s post is a piece of the story, and that maybe someday I could re-organize it into a book. Yes, I think doing it little by little the way you’ve been has been wonderful. Still, I’d love to see your posts compiled into a book. Have you seen the WWII London Blitz Diaries at http://womanlondonblitz.blogspot.com/? They were written by an adult but I’m pleased that they’ve been turned into books. All the best to you with whatever you do, Sheryl. I’m enjoying reading both your grandmother’s diary entries and your thoughts. I hadn’t seen it. Thanks for sending me the link. I quickly glanced at it and it looks really good. I look forward to digging more deeply into it. Along side your grandmother’s diary you have created yet another treasure for your family. I thank you for sharing it with us also. I’m late to the game. My family has been active in preserving our family’s history for years. Bless their hearts, now that I’m interested, the information is there. Life was sure different 100 years ago. Thanks for the nice note. Like you I only started doing genealogy relatively recently. I’ve found it to be one of the most rewarding things I do. What a great idea! I thought about collecting recipes, but never did it. i love that you did it. And, what a time capsule the diary is. As you say, your memories of an old, frail lady belie the fact that she was once young, What a message for children and grandchildren. After researching my Family’s History for a very long time, am now focussed on bringing some meaning into all the dates etc., and helping others to see the Ancestors as I see them: living, loving, hurting, laughing human beings. Thanks for “liking” one of my stories through which I discovered the delight that is your Grandmother’s Diary. Thanks for stopping by. It’s always wonderful to hear when someone enjoys this this blog. Like you, I feel that it’s very important to bring meaning to all of the dates, etc. The stories and context are what brings the past to life. What a wonderful idea for a blog! And what a great keepsake for generations to come. I look forward to following. Thanks for nominating me. I’m honored. Wow what a beautiful effort and idea to commemorate your grandmother! Thank you for sharing. Enjoy your site! I’m doing a similar project with my dad’s journals from the 1950s through 1990s, but I have 40 years to put up! Thanks for stopping by–and for telling me about your site. I went to it and had a wonderful time exploring it. I’m really impressed by the wonderful design and organizational elements. I’d thought about using Dreamweaver when I started my blog and decided that it probably was beyond me. It’s really fun to see how someone else used Dreamweaver for a family history blog. I really enjoy doing this blog and It’s always nice to hear when someone enjoys it. I visited several of your blogs and enjoyed each of them. I like the way each has a distinct purpose and feel. Sheryl, what a wonderful treasure you have with your grandmother’s diary! I run across old photos in the local antique stores and always wonder why someone would throw them away. How sad it is that no one wants them. I am so very fortunate to have the dairy. It is a wonderful way to get to better know my grandmother. I also often see old photos at antique stores and flea markets–and, like you, I always wonder how they ended up there. It does seem sad. That is amazing you can enjoy this a century later. I don’t even have a picture of my great-grandmother, your kids are really fortunate. We are very fortunate. I don’t have very many pictures of my grandmother when she was young; and I really wish that I had more, but your comment makes me realize that I need to treasure what I have. There’s something going on recently about taking old pictures and going back to where they were taken, holding them up in front of the scene and taking a picture of what it looks like now,, compared to the scene in the picture. Have you heard of that? The fact that you have pictures makes this seem a natural. I have nominated you for the Creative Chaos Award. I just wanted you to know I think your blog is awesome! You do not have to accept it but if you want to to see what you have to do to keep it click here (http://wp.me/p2dVLB-9Z ). It was kind of fun! Thanks for nominating me. I’m honored that you think my blog is deserving of it. I read about this blog on the NEHGS newsletter, The Weekly Genealogist. I am glad that I checked up on this article. You are providing a great idea to the rest of us that are not satisfied with a published genealogy. They can be so lacking of the personal lifes of our ancestors. I, too, put together a cookbook for a nephew and his new bride. He grew up 1000 miles from the family center & therefore did not know much about us or his ancestors. I have a small notebook of handwritten recipes from my mother’s father’s mother & her mother. I copied those & added family stories connected to the recipes. They treasure that gift. I asked him to add his favorite recipes & stories to the book & give it to his children. The way you add information and bring the experience forward takes alot of time & trouble. I can appreciate your work. Thank you for providing such an excellent blog. Thanks for the nice note. It’s always wonderful to hear when someone enjoys this blog. I really enjoy doing the research. It helps me better understand my grandmother and her times. The process of doing one day at time a time encourages me to think more deeply about her family, what houses and farms were like back then, etc. The cookbook that you did for your nephew and his wife sounds awesome. I’ve also found that my children and other relatives have really enjoyed the family cookbook that I did. Thanks for the nice note. I have a lot of fun doing this blog, and it’s always wonderful to hear when someone enjoys it. I no longer live in the McEwensville area, but enjoy getting back there whenever I can. You’re right–it always will be home. Thank you for nominating me. I am honored that you think that this blog is deserving of the award. Thanks for nominating me for the award. I really appreciate that it. Hi Sheryl. You are very welcome! Your blog makes me feel like I am getting to know your Grandma a bit, myself. I hope that doesn’t sound presumptuous. But I do think it’s an honour to read it and I thank you for sharing her diary. Thank you for the very kind comment. I hope that others feel like they are getting to know my grandmother a bit as they read the posts–and it’s nice to know that you feel that way. What a great blog concept! So interesting. I’m really enjoying this glimpse into the past. Thanks for stopping by my little world, too. What a fantastic idea! I can’t wait to read more each day. My grandmother (Nana) has been keeping journals for years, decades, and I can’t wait to read them. The only reason I am being patient is because I will probably cry through them because I love my Nana dearly and will miss her when she is gone. She is 92 and going strong right now though! You’re so fortunate to have a grandmother who’s going strong at 92. Cherish every moment. I love history, and more particular, family histories. This looks like a great blog site. Sheryl: I found your blog exciting, intelligent, creative, and brim full of love. I will return to it day to day to see about you and Helena. I will share your lovely writings with my Memoir Writing Class. Thank you!! Thanks for the nice note. Your memoir class sounds like a lot of fun. What a cool idea for a blog! I will enjoy reading these. I enjoy family history as well. I’m amazed and impressed that she uses email. Not many people who are 90+ know how to do that. I know. She is an amazing woman and still very active mentally and physically. You are so lucky. I have one picture of each of my grandmothers (one died prior to my birth and the other when I was 3) and not much else. My parents, aunts and uncles are gone so I will never know who they really were. So fascinating, and I love the idea of going back to a slower time through the diary. I love your blog and the concept. I am going to add to blogroll and visit often to see what grandma and you are up to! So lovely that you have your grandmother’s diary. I have my grandmother’s handwritten recipe book, wihich I treasure, but alas…no diary. And isn’t it interesting that some days she has nothing to say? I’m like that with my blog — I certainly don’t want to bore people with ramblings of nothing — yet wouldn’t we like to know what really went on in her days of “not much happened today.” ? I always wish that Grandma had written about the “boring” things on the days when she had nothing to say. What did they eat for breakfast? for dinner? . . . How did her family do their laundry? . . . Did she milk the cows every day (or just occasionally)? . . What about gathering eggs? . . . Thanks so much for your blog! I found out about it when you “liked” a post of mind back in October. I have a link to your blog in my post today (http://boomerang2.wordpress.com/2013/01/01/happy-new-year-and-2013-boomerang-resolution/), explaining how it inspired me to do something I’m trying with mine in 2012. All best, thanks again, and Happy New Year! I truly enjoyed my visit at your blog today. If only I had ancestors who would have left a diary as detailed as this . . . you are truly blessed to have such a wonderful gift. Happy New Year to you and yours! 哇, it’s so cool to see how far your grandma had come from being my age to, well, a grandma! It is really fun how the diary provides a window into what a person was like at a totally different point in their life. It looks like we both had chronicling grandmothers, and you’re right, I find the entries spark so many unanswerable questions and intriguing hints. At times I suspected my grandmother kept a secret expanded diary (wishful thinking perhaps) but I have never come across it. Your blog is great. Thanks for the nice note. It’s always wonderful to hear when someone enjoys this blog. I also like your blog. It’s fun to read another diary from the same general time period. I find it quite admirable that you are able to keep and share your family history. I wonder if anyone would do the same with what I pen. Most of what I have written remains unread. I only started blogging about two years ago. Continued success. You encourage me to look into my family hers and history. Thank you for nominating A Hundred Years Ago. I’m honored that you think it is worthy of the award. Thanks for the nice note. I’ve had a lot of fun sharing this diary. That’s wonderful idea! Hmmm I should start doing the same while still can get some stories from my mam and relatives. I’ve enjoyed asking my father about some of the things in Grandma’s diary. (She was his mother.) It’s been a great conversation starter for the two of us. I am so sorry I cannot ask my grandfathers anymore. I am glad I could spend a lot of time with one of them and learn about a ‘black-smith’ and art. Maybe that’s why making jewellery attracting me – ‘small black-smith’ ;-). I am very pity I could not spend enouth time with my other grandpa who was a tilor – great my mom could tell me a lot about him. Yes… you are really right writing all down… I will probably start new blog… Thanks a lot! Her diary is like looking through a little window into a much simpler time and world. Thanks for sharing. What an amazing and facinating project. Your blog could very well be a keepsake for generations to come. Brilliant – I love it! A blog with so much joy, love and inspiration to give. What a cool idea! I’m a sucker for “old tyme” stuff like this. I just hit the follow button. Looking forward to more posts! It is a pleasure to find someone who shares my interest in history and family. I LOVE your project, and think you are doing a great job with it. Will definitely follow! Very clever idea for a blog. A great way to share family history and to simply reflect on the past. Wow I keep a diary that must be such a gift to you, reading about her life, I would love this connection with my grandparents which I can hardly remember. What a great tribute to you Grand mother. I am very fortunate to have the dairy. Thanks for taking a moment to write the nice note. Hello Sheryl,Your blog is so interesting and beautifully done! I going to browse around this weekend and enjoy reading this all. Thanks for sharing, Johanna. Thanks for stopping by. I’m glad you found it interesting. Your blog is delightful. As you share your grandmother’s diary, you, in turn, are creating a lovely legacy for your family, and all readers. Thanks for the nice note. I have a lot of fun doing this blog and enjoy sharing it with others. How exciting to find a dairy like that! I don’t think my grandmother wrote a diary, but I found a stack of love letters that my father sent her. The amazing thing is that he wrote the love letters after they had been married long enough to have four children! They were in love with each other throughout their marriage. Anyway, congrats on finding the diary. what a treasure! This is a great idea for a blog. I love stories and how we can learn from others. This gives readers a great view into the past. I’m enjoying your blog! I grew up just over the hill past your Grandma’s house and pass it quite often as my parents still live on the next farmette (toward Oakes’). I remember visiting Grandma Oakes (as we called her) and the Hesters when I was very young. Thanks for taking a moment to write a note. It’s awesome that you knew the Hesters and “Grandma” Oakes. I think that the area where you grew up is such a beautiful rural setting. Jnana–Thank you for nominating A Hundred Years Ago for the award. I am honored that you think it is worthy of it, however, I will need to decline. Thanks again for thinking of me. Oh my goodness, this blog is right up my alley. What a fascinating project. Thanks for sharing! What an excellent way to share and honor your grandmother. I am so glad that I found you. Can’t wait to read through all the posts I’ve missed and get caught up. Thanks for taking a moment to write the nice note. It’s always wonderful to hear when someone enjoys this blog. What a charming idea! Your grandmother would be so happy! Just wanted to let you know that I’ve nominated A Hundred Years Ago for a Sunshine Award. I enjoy reading your work and feel that it embodies the spirit of the Sunshine Awards. You help your readers appreciate not only their immediate past, but the past of ancestors long gone. You’re helping us all to “light up the dark corners of our minds”. And, thank you for all you’re doing to make our world a kinder, more thoughtful one. What beautiful countryside in your header photo and to think you family has been there for generations. I love family histories and you’re lucky to have so many photographs and so well documented. Thanks for stopping by. I’m glad you enjoy the blog. One thing I should clarify–relatives no longer live in the home where Grandma grew up; but fortunately the person that currently lives there takes wonderful care of it. What an incredible opportunity to learn about your family history as well as sharing classic recipes with us all…and giving us a glimpse of life back then. Wonderful blog. Thanks for the nice note. I have a lot of fun doing this blog and it’s always wonderful to hear when someone enjoys it. Neat! It is fascinating to read such diaries, it gives an insight that just can’t be found anywhere else. The few posts I have read already, I have enjoyed your expansion on the topic. My blog started out mostly working off of a set of letters, and posting excerpts from them, then it drifted to gardens, I shall have to get back to the letters. I like the way diaries can provide candid, dynamic snapshots of everyday life. They also provide an intimate glimpse of the author–and share the writer’s hopes and fears. This is absolutely fascinating! I am so glad Tracy pointed me to your blog!! Truly a wonderful concept for a blog. Thank you for sharing with us. I’m glad you enjoy it. Thanks for taking a moment to write a note. Several years ago I really enjoyed pulling together the recipes, etc. for the family cookbook that I did. My children and other relatives use it regularly–and it was a really rewarding project. I think that you’ll also enjoy doing a cookbook with your granny’s recipes..
Just read your blog and am thrilled for you to have found your grandmother’s diary. What a treasure it must be to you and other members of the family. I too have very fond memories of my paternal grandmother – only grandmother I had as my mother’s Mom passed before she married. Anyways, I have a few of her recipes also and will always treasure them. I am very fortunate to have the diary. Grandmothers are special people! How lucky you are to have the diary ….. I have been researching my family history and how I wish they’d kept diaries! Thanks! I’m glad you enjoy this blog. Different people leave behind different artifacts–and it’s fun to try to put the pieces together. I am very fortunate to have the diary. My grandmother kept diaries for years; unfortunately, I never got to read therm. I would love to know what her life was like. I will read your entries with interest. Do you have from her an old time sugar cookie recipe? I have looked everywhere for my mothers but alas, I cannot find it. When I’m browsing through old cookbooks and magazines I’ll have to keep my eyes open for sugar cookie recipes. Wow, it’s awesome that you knew Jim Muffly–and it is really exciting that you have an AVMA program that mentions the presentation of his invention. I knew that he was known for his expertise in using magnets to remove hardware from cows, but hadn’t realized that he and your father had invented a specific tool. I have some pictures of Jim Muffly as an older man using the magnetic retriever to treat a cow that my mother took. The one picture in the post is from that day, but it doesn’t show the tool. Hi Sheryl, I have attached (1) the flyer for Dr. Muffly’s retriever, (2) the cover of the July 1964 program, and (3) Dr. Muffly’s listing in the program. My father considered Dr. Muffly a very good friend. The impression I carry of Dr. Muffly is that of a kind and gentle person. It’s just fantastic that you have this lovely blog and that the wonder of the internet can bring people together! Thank you so much! This is fascinating. I will look forward to reading some if her/your entries. Thanks for the note. It’s nice to hear that you enjoy this blog. What a great concept for a blog!! And an awesome way to connect with your grandmother in a way you didn’t know her when she was alive! Thanks for stopping by. I am very fortunate to be able to connect with my grandmother via the diary/blog. This is such a lovely blog and I so look forward to reading it! Blessings to you and your family! Thanks for the nice note. I’m glad you enjoy this blog. This is a fascinating idea. Within the next year, I plan to begin a blog – possibly for the eyes of my family only – to record the family history I’m aware of. Once I go, the memories of my mother’s family will otherwise be gone forever. How wonderful to have a diary.and to use it as a jumping off point for further research. I look forward to reading more of the posts that you have alrerady written, as well as future entries. I have really enjoyed doing this, and I think that you’ll also have fun recording your family history in a blog for your family members. Your grandmother’s diary: What a treasure! I love nostalgia. Thank you for sharing this.. Thanks! It’s nice to hear when someone enjoys this blog. Thanks for sharing the great stories of the past, they’re certainly worth reading and enjoying. This is really a cool idea. A hundred years ago seems like a very long time when you say it, but when you are over fifty, you realize not so much time has passed. Times have changed dramatically, and yet the emotional experiences are so very much the same. It is interesting to see the minutiae of every day life that a diary so well illustrates. Thank you for sharing! I know what you mean. I have many of the same feelings. What a great idea! Look forward to reading more. Thanks. I’m glad you enjoy it. Thanks for the information about the Association of Personal Historians. Until I read your comment I’d never heard of it. It looks like a wonderful organization. As the diary winds down (it ends in Dec. 1914), I need to think about next steps and how to preserve the information. What a wonderful idea for a blog – I am sorry that I am only now discovering the fabulous Helena but I look forward to whatever she has to say! Welcome! Thanks for taking a moment to write the kind note. What a treasure! Thanks for sharing. I’d like to follow your blog, but not sure how to subscribe. You can click on the Entries RRS feed just below the picture in the header. . . . or if you click on “follow” it will appear in your WordPress reader. So glad you have the opportunity to learn more about your ancestors through this diary. I am very fortunate to have the diary. I love what you are doing here. The contrast and connection between the diary entries and your comments is fascinating. I am a rather reluctant historian, but this kind of personal narrative I find really engaging. My research is in a different time period and geographical-cultural area, and I would love to find a journal detailing the daily life and thought of someone but it is unlikely – oh well – I can read your blog – thank you for publishing it. Thank you for taking a moment to write the kind note. I have a lot of fun doing the research for this blog, and it’s always wonderful to hear when someone enjoys it. What a beautiful tribute to your grandmother! I look forward to reading more! Enjoy your day! I’m glad you like it. Thanks for stopping by. What a wonderful blog! I smiled as soon as I read your latest post–this is such a treasure. Thank you for sharing with all of us. I look forward to reading more…. I have a lot of fun doing this blog, and it’s always wonderful to hear when others enjoy it. The honey candy sounds delicious, the health statistics on height and weight and such make such good reading; there is a lot here to read and savor. Most of all, it’s delightful to read your great affection and warmth for your dear ancestor and the people in her culture. This is a welcome interlude, and I’ll be visiting to read the rest. Thank you for the kind words. The books sound good. I’m going to add them to my “to read” list.I enjoy reading old novels. I’m currently reading Daisy Thornton by Mary Jane Holmes. Wonderful concept for a blog. Love it. You have a fascinating blog. 🙂 wishing you well. I love your blog and enjoy reading your posts every day! In fact, you inspired me to post my own grandmother’s journal entries 🙂 I also nominated you for the One Lovely Blog Award on my blog: http://mypeopleinhistory.wordpress.com/2014/09/29/one-lovely-blog-award/ I look forward to reading more! Thank you for the nomination! And, it is a pleasant surprise that my posts motivated you to post your own grandmother’s diary. I have a lot of fun doing this blog, and it’s nice to hear when someone finds it interesting and useful. . Thank you for sharing this treasure! Our life’s journey is made up of the journey of others. So many don’t recognize the importance of the past; I’m pleased you do. Hey there Sheryl! Just tuned into your blog and thought it was fun, so I gave you a follow. This project is so cool! Love what you’re doing with your blog. Old diaries–especially those of an earlier generation–are fascinating. What a wonderful legacy you are leaving for your Grandmother. I also find it fascinating how people kept diaries years ago. They provide a nice window into their lives. Thank you for the kind words. My Great-great grandparents, Dorothy and Henry Gearhart, are buried in the Messiah Lutheran Church Cemetery. I’m guessing they attended the same church.